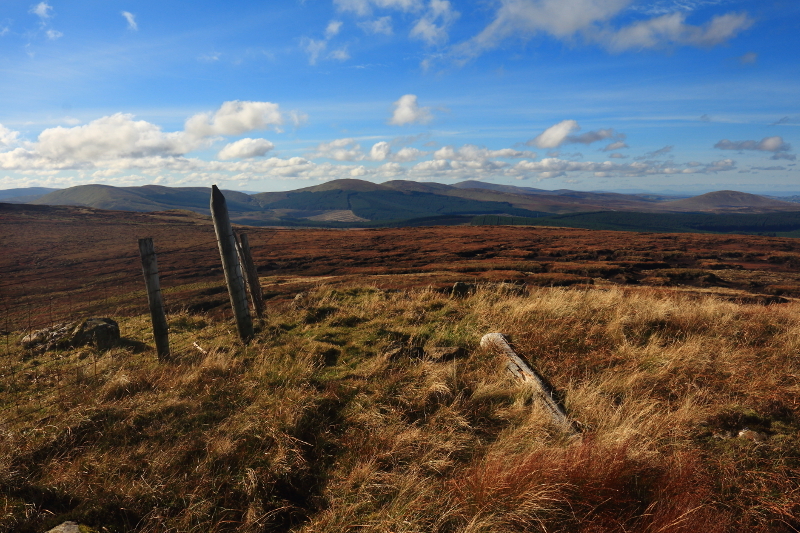 White Mountain is the 451st highest place in Ireland. See summit comment on Mullaghmore for my approach to White Mountain - from the south and Moydamlaght Forest, via Craig-na-Shoke. From Mullaghmore, I took the access road for the mast. About half way between the summit of Mullaghmore and a sharp bend in the access road, I reached a point where a fence led up to the summit. Initially I regretted this route due to peat hags and some boggy ground. The summit looked a bit non-descript from here, and I started to think this was a bit of an empty exercise in pointless summit bagging, especially after the enjoyable walk up Mullaghmore. It was a short diversion to take in this top however, and reaching the summit, I was glad I took it. It was dry and rocky - easy to walk on. There were similarly expansive views as on Mullaghmore over almost the whole of Ulster, from the Derryveagh Mountains in Donegal, to the faint Mournes on the east coast, with Lough Neagh on the way. Great views to the north too, to Benbradagh and Lough Foyle.